The Writer feature types represent "what you want", but that is often not the same as "what you have". Therefore you need to edit the Writer feature types to get the structure that you desire. Also, depending on format, you may need to add further Writers. How you add new feature types depends on whether it is a new Writer or an existing one. 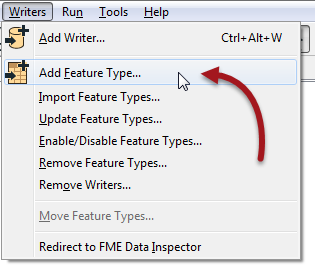 Adding a feature type opens the Feature Type Properties dialog in order to edit the new feature type&apos;s properties. It&apos;s worth remembering that, with format-specific terminology, instead of "Feature Type" this dialog&apos;s labels may state "Feature Class," "Layer," "Sheet," or whatever terminology is specific to the format of data you are writing. 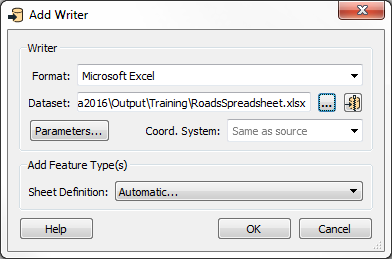 Here the user has added a new feature type and is manually defining the attributes that belong to it. Copy from Reader: Adds a new feature type with manual attribute definition; however, the attributes are pre-defined to an existing Reader schema. This is useful when you have manually added a Reader and want to duplicate its schema on the Writer. Import from Dataset: Adds a new feature type with manual attribute definition parameter; however, the attributes are pre-defined to an external dataset schema. This is useful where - for example - you are adding a Writer to write to a database; the database tables already exist and you use this tool to copy their schema definition into the workspace. None: Does not add any new feature type. This is a rare scenario; usually you are adding a Writer but are not yet ready to define its schema.